Here's the progressive view from my front door. We have over a foot by now, with drifts even larger. Playing in the snow is fun, but I hate the mess! All of these clothes, hats, gloves are in the dryer right now in preparation for Round 2. So...I told you we were crafty yesterday. Here's one of the ghost garlands we made...SUPER cute! Abbey is wearing Will's Davy Crockett coonskin hat--that cracks me UP! To make the ghosts, we modified these instructions a little bit. We made several to hang on the banister as well! Cute. I brought our pumpkins in on Tuesday night when it started snowing so they wouldn't turn to mush. Jack-the-beagle won't leave them alone. He's almost gnawed the stems off of two of them. Grrrrr..... I think we're going to carve them tonight! My very creative friend, Jen, made this pumpkin bowling set. She let me borrow it for Abbey's party at school tomorrow. We're also going to do an eyeball relay--hence the eyeball picture at the top of the post. Ever tried bowling with a "ball" that isn't round? It's hysterical. I'm going to make some caramel apples for Abbey's book club that meets tomorrow after school, and I still need to bake a few things for our neighborhood Halloween carnival on Saturday. I wish I had taken a picture of my black/orange stripey pretzels. They turned out super cute! And I (finally) finished everyone's Halloween costumes. The girls changed their minds umpteen bajillion times, but they're pleased with the final results and I am too! Abbey is a veterinarian (click on the pic and read her name tag. Will is a gnome (still trying to talk him into letting me make him some bushy eyebrows), and Sarah is a hippie. I think they look GREAT! Just got a text from John. He's about 25 miles from home. Those last 25 miles are probably the most treacherous though. So ready to see him. I'll be back tomorrow with the last of my Anniversary Week Giveaways! Anniversary Week continues and I hope you're having fun because I sure am! I absolutely love this ribbon plate that Jillian gave me earlier this year. The one I have is from Southern Living at Home, but sadly it has been discontinued. However, I found a similar version at Michael's and that's what I'm giving away today! Leave me a comment and tell me something(s) you're thankful for. Today, I'm thankful for these three kiddos. John and I are crazy about them! I'm also thankful for my husband who works hard so that I can stay at home, and for new SmartWool socks! I got some fun ones the other day--they make me smile AND they keep my feet super warm!!! I usually use Sharpies or my ZIG markers. Just test an area first to make sure it comes off--sometimes I have to really scrub. Anyway, the possibilities are as vast as your imagination. And I suppose you could use it as a serving piece as well! So tell me what you're thankful for today and maybe you'll be the lucky winner of this giveaway! Happy Tuesday everyone! I had so much fun reading all of your comments yesterday and now I have lots of new stuff I want to check out on iTunes. Thank you! 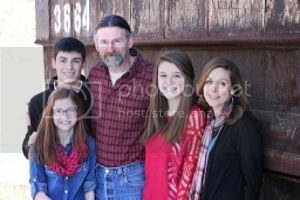 John has taken several of the characters in the Nativity story--Mary, Joseph, Gabriel, Zachariah, and more-- and told the story of Jesus' birth from their perspective. You can read the first chapter here. I personally think it's a brilliant book, but others are giving it great reviews too. I am so incredibly proud of John. To enter the book giveaway, I want you to leave a comment telling me one thing that just makes Christmas feel like Christmas for you. Maybe it's the music, maybe it is certain smells or all the delicious food or the Christmas tree or your nativity scene. Maybe you're Jewish and you celebrate Hannukah. Share something that makes that special for you. There is no right or wrong answer! For me...it's our Advent wreath. We keep it on the table, read the designated scriptures, light the candles, and eat by candlelight each night at dinner. It is a deliberate time at the end of our day to slow down and focus on what the season is about. I love it so much. 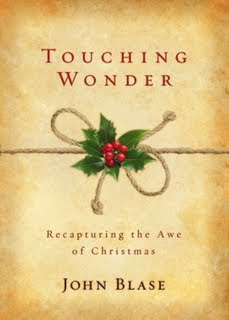 I know that many of you have already bought a copy of Touching Wonder. Thank you! Please feel free to enter the giveaway though. I'm sure there is someone you can gift with this book! I also want to mention that Touching Wonder was illustrated by our dear friend, Amanda. John is giving away a print of one of Amanda's sketches (cool!!!) along with a copy of his book over on his blog this week. You can click here to see the print and to enter his giveaway. Four years ago today, I started this blog. What started out as a way for our family and friends in Arkansas to keep up my family has turned into SO much more than I ever imagined. Through this blog I've reconnected with old friends and made dozens of new ones. You guys have loved me, laughed with me, prayed for me, and have made the internet such a happy place to visit each day. 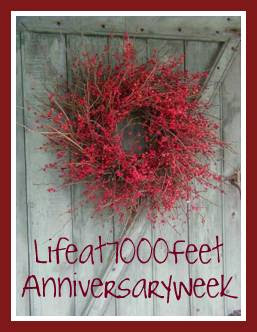 I'm declaring it Anniversary Week here at Lifeat7000Feet, and beginning tomorrow I'm going to be giving away something fun every single day this week. Whether you're a long time reader or a brand new one, you're eligible to enter the giveaways! You'll have to visit each day to find out what the giveaway-of-the-day is but I'll leave each one open until next Saturday, and draw/post all winners on Sunday. Should be a fun week! 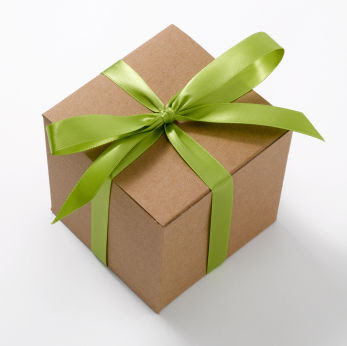 Tune in tomorrow to see what fun prize one lucky reader could win! I wish today had been a snow day. It's snowing (and blowing) but looks like our district is having school. I wish that I had time today to pull out my sewing machine and finish the kids costumes. (Wow, never thought I'd say that but weirdly, it's true). I wish I had a day to stay at home this week. And I wish the next two weekends weren't so full. I wish I had time to blog about the two salesgirls I've encountered in the last few weeks who have given me a major complex about my wrinkles. I wish I had time to blog, period. And I wish I had time to read and comment on the posts that are piling up in my google reader. I feel like such a bad blog friend these days. I wish every day could be like Monday was for me this week. I started out with a heavy heart, but God sent some dear friends my way and TOTALLY redeemed the day. I will blog about it as soon as I quit meeting myself coming and going. I wish October didn't feel so busy. I wish I was drinking a Pumpkin Spice latte from Starbucks right now. (Yes, I'm addicted). I wish the Razorbacks hadn't had to play the referees AND the Gators on Saturday. I'm still bitter about their loss. I wish I could get over it. I wish breakfast would make itself. But it won't. So I must go. By the way, this week John is giving away a book and a notebook. If you're interested, there is still time to enter his giveaway. I have two burning questions and need some feedback from all of you guys out there in the blog world. Question #1: Do you have any fun ideas for Halloween/Fall party games? I'm considering Pumpkin Bowling and Fall Bingo but I need another one or two ideas that would be appropriate for second graders. Question #2: Do any of you wear Bare Minerals? I bought some last month (first time I've bought new make-up in forever) and I think it's causing my skin to break out. Anyone had that issue? I have so many thoughts swirling around in my head these days. I've tried to blog about a few of them and just can't seem to get what is in my head to make any sense once I start typing. So I'm just going to catch up on what's going on around here. It's been a short week for us. Yesterday was a half-day of school (for my middle-schoolers) and everyone is out today and tomorrow. I slept late this morning (7am is late for me) and the kids are still sleeping. I'm excited about this four-day weekend. Just wish John didn't have to work and could hang out with us. Today is full of parent-teacher conferences for me. And house cleaning. I also need to finish up my menu plan and grocery list and figure out when I can grocery shop without taking everyone to the store with me! It will probably end up being this weekend, but of course, I have to arrange my schedule around the Arkansas-Florida game and a few other important things. Our weekend is pretty full...and I'm trying to be okay with that. I don't know when I turned into such an anti-activity girl. Sarah loves to cook and bake and yesterday afternoon asked if she could make some play-dough. I love that she still loves playing with play-dough. After making sure we had all the ingredients (we had to empty the salt-shaker) we whipped up a batch. Seriously, this is the easiest recipe. Takes five minutes from start to finish and it kept her happy for a long time! Sarah also wanted to bake something. I suggested we make something with pumpkin since I had an open can in the fridge from my pumpkin spice latte. She agreed and we did some searching. She decided against Pumpkin Cheesecake Cups and Pumpkin-Chocolate Chip Muffins in favor of a Pumpkin Cake Roll. Oh my goodness. It was good! And she learned some fancy-schmancy baking skills while her mother learned patience. Win-win! By the way, is there a canned pumpkin shortage on your grocery store shelves? I have had a HARD time finding it this fall. I finally found some and now I'm hoarding it. I think others have the same idea! It's scarce around these parts. I have so much more to say, but I've run out of time. Must get moving. I'll be back soon! PS--Today is the last day to enter the book/shirt/cap giveaway on John's blog. Just wanted to pop in and let you know that John is doing the second of his Twelve-Weeks-Until-Christmas-Book-and-(some other cool prize)-Giveaway on his blog. This week you can enter to win John's book AND a cool men's shirt and cap from BuffaloandCompany. (Think Christmas gifts, ladies!) Anyway, click here to meet our friend, Xan (pronounced "Zan") and read the details of the giveaway. That's it! This may be one of the shortest posts I've ever written. Wow. This is a post about beans. I'm a fan of beans. Most beans are a high quality protein, are full of antioxidants, and are loaded with fiber. I could tout all the nutritional benefits of beans or you could read more about them here. (Or perhaps my friend, Tiffani--akaGooglemeister, could do a little research for us. Sorry that's sort of an inside joke, but I could not resist). Last spring I did a series of posts about my meal planning system, and I shared my time-saving tip about pre-cooking all my meat. My friend Diane commented on that post and told me that she did the same thing with beans. She buys dried beans, cooks up a big pot, and freezes them. I never knew you could freeze beans. Did you? I've been doing this for several months now and let me tell you it is not only easy but it is SO MUCH CHEAPER than buying cans of beans! For my most recent two-week meal plan, I needed 7 cans of beans--four black, two pinto, and one kidney. The cheapest (Walmart, generic) can of beans is $.72. A one pound bag of dried black beans is $1.12 and equals FIVE cans of beans. That comes out to roughly $.22/can. A savings $.50/can. I bought three (1lb) bags of dried beans last time I shopped. (For some reason, pinto beans are cheaper than kidney and black beans.) I spent about $3.20 for the equivalent of 15 cans of beans, saving me about $7.50 (for 15 cans). Sure, that may not seem like a lot of saved money. And for some of you, the time you'd have to spend cooking a pot of beans is worth the extra cost of buying them canned. For me, it's a no brainer. I like saving money (even small amounts add up) and I have the time to cook up a pot every couple of weeks. I generally pick a morning that I'm going to be at home, and soak my beans the night before (the instructions are on the packaging). In the morning, I just put a pot on and let them simmer away. For some reason, it always takes longer than the directions claim. I wonder if it's because I live at a high altitude? Next, I drain, rinse, cool and then package them in freezer bags, and freeze until needed. I've added frozen beans to the crock pot (for chili) and they turn out just fine, but usually I thaw them along with my meat. I've been buying my dried beans at Walmart, but I just noticed that my natural foods store sells organic beans in bulk. They come in a larger quantity (2lbs instead of 1lb) but the price per pound ends up being cheaper (for organic!) so I'll be buying those the rest of the winter. Anyway, just thought I'd share my newest money-saving strategy. Thank you, Diane! Believe it or not, I'm not original in dedicating an entire post to beans. I recently found this blog (love it!) and she wrote about beans twice last week. I want to try some of her recipes soon! Got a favorite bean recipe? Please share!!! L-A-Z-Y. If you know me, then you know that lazy weekends make me happy, happy, happy! 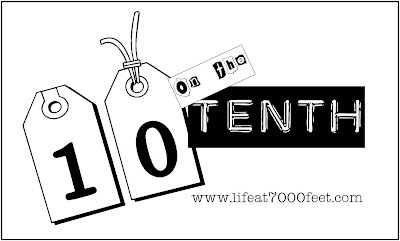 Since October is the tenth month of the year, the theme of this month's list is the number ten. Brilliant, eh? It's probably more random than brilliant, so stay with me please. 1. 10AM Mountain Standard Time. That's the time that Arkansas plays Auburn tomorrow (10/10) in Fayetteville. Of all the SEC teams I like Auburn the least. Sorry, Lisa. Hoping the Hogs can pull out the win--Woo Pig Sooie! If you're not from the South and want to know what all this Woo Pig Sooie stuff is about, go check out Harper and Kelly calling the HOGS! 2. $10/month is what we pay for our basic cable. That basic cable does not include ESPN or ESPN2 which have televised almost every Arkansas game this season. Big Sigh. However, so far I've been able to watch all the games on ESPN360.com I'm so glad Al Gore invented the internet, aren't you? 3. I'm hoping to make good use of the $10+ that I spent at Archiver's yesterday and complete at least 10 scrapbook pages tomorrow. I have a six-foot table set up in my bedroom and all my scrapbooking stuff is out and ready for me to get some work done while I watch the game on my laptop! I did this last Saturday night with Abbey and we had so much fun together that we're planning a repeat. 4. 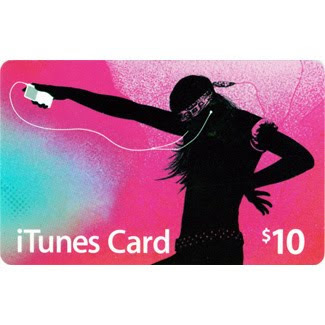 Hey, I won a $10 Walmart gift card from Amber this week. I asked her what she thought I should spend it on and she suggested I buy the stuff to make some more of this. 5. I'll have to decline her suggestion though because we blew through our fall mix in a few days and it's going to take more than a few days to shed the 10lbs I gained from eating it. Truthfully, I didn't gain 10lbs from eating fall mix. It was more like five. I have however, gained 10lbs since 2007. That's the year that I'm currently trying to scrapbook and looking at pics of myself from two years ago is making me realize I need to lose some weight. 6. Wondering if Old Navy is going to have their jeans on sale for $10 anytime soon. Abbey only has one pair that still fits. We've rotated between track pants and jeans all week and I've got to go buy her some soon. I love those $10 promos they run from time to time. Guess I'll go check online. 7. Dinner tonight: Pizza. It will take me 10 minutes to go pick it up, will cost around $10 (gotta love Papa Murphy's and their prolific coupons) and it will take 10 minutes to bake. It will likely be the first time in the last ten days that I won't hear a hear a single complaint about dinner. Priceless. 8. I did a serious email inbox purge a few weeks ago and have kept no more than 10 emails in my inbox for THREE WHOLE WEEKS! (Wish I could keep with the ten theme here, but that would be a lie.) It is a beautiful, beautiful thing to have an almost empty inbox. 9. Shoot. I was going to try to have this posted by 10AM but I got distracted trying to come up with interesting things in tens. I'm running out of ideas and feeling a bit sluggish this morning after staying up way past my 10pm bedtime. It also isn't helping that the temperature outside is only 10 + 10 + 10. Need more coffee! 10. Okay, your turn. Here's a fill in the blank question for you. If you are so inclined, you can leave your answer in the form of a comment. I would be thrilled if I had ten ________________. As always, you're welcome to join in the 10 on the 10th fun. Just post a list of 10 things on your blog--it can be any 10 things you can think of--and link to your post in the box below. Easy-peasy. I went to the store last night. I was wandering the aisles of Wal-Mart and happened upon the candy corn. Oh my, MY. I love that sugary-yellow-white-and-orange-triangular-shaped-candy SO much. It's probably a very good thing that it's only available seasonally. I couldn't resist putting it in my buggy (that's a cart for all you non-Southerners). And then I remembered the Fall Mix that my friend, Tracy, brought to our scrapbook-fest last weekend--the Fall Mix that I could not leave alone because I have no willpower and gained four pounds from inhaling nibbled on all weekend. It's a mix of candy corn, Reese's pieces, and peanuts. The combination of flavors is WONDERFUL, and the colors just scream fall! The memory of it's deliciousness was enough to make me turn my buggy-cart around and head to the back of the store for some peanuts (roasted, salted or unsalted) and then to the candy aisle to find the Reese's pieces. I don't really think there is an exact recipe. You just dump it all in a bowl and mix it up. I used about half a bag of candy corn (because I have some purists in my house who haven't become Fall Mix converts...yet), half a bag of the Reese's, and maybe 3/4 jar of the peanuts. It is SO pretty and SO good. PS (for the grandparents)--Sarah went back to school today, and we're both dreading the make-up work she's going to be bringing home! Abbey's school was closed for a teacher workday so she's home with me. They've both been fever-free since yesterday morning. Woohoo! We may even go for a drive to see the aspens this weekend.